Second week of TCMF kicks off with a big bang boom! OBA! 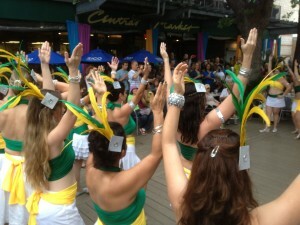 Austin Samba School brings Carnaval to Central Market and TCMF! Austin — The Eighth Annual Texas Community Music Festival entered its second swinging week Saturday at Central Market North with performances by some old friends — packing the Cafe patio with dancers — and ended with a Brazilian style Carnaval — which got EVERYBODY in the house dancing! The day began with a return engagement by the NUMBERS, a Dixieland band composed of math professors from ACC, and then went to the EIGHTH straight appearance by the Hill Country Community Band of Wimberley… a charter member of the TCMF Family. Another veteran TCMF group, The Lone Star Swing Syndicate, shared a lively repertoire of swing favorites, followed by an exciting performance by two-time TCMF participant, the Vintage 15. Gypsy Jazz band, Hot Club Soda were up next, and made their third straight appearance at TCMF. Things got funky next, as SEVEN time TCMF veterans, Rhythm Congress took the stage with an inspired and “down-blooded” set of R&B classics. And the evening culminating in a stirring performance by the Austin Samba School and its lively Brazilian Carnaval show. Even if you weren’t on the dance floor, everybody in the house was shaking something! OBA! Special thanks to special showcase performers MT Hellton and friends, who provided song stylings throughout the afternoon, and will return Sunday for another day of music. TCMF continues Sunday at 11am at Central Market North and features performances through Thursday, May 2. Come on out Sunday and enjoy some fabulous musicians, culminating in a repeat performance by TCMF hosts, the Austin Civic Wind Ensemble. Check the schedule page for details.